Petition is now over 16,000 supporters, with over 2,500 comments (see Petition Comments). For information on how to help support the NSC see here. Donna Fraser, London England: Crystal Palace is the South East hub for our futrue sporting champions! Lucie Allen, London England: Vital facilty for the local and wider community, encouraging participation in sport as well as providing accessibility. KT Coates, Ware England: I have used this facility from the age of 8 years old. Now I will be running our world championships here next summer. Crystal Palace National Sports Centre has inspired me since youth to achieve great things in sport. If it is reduced or taken away there will be nothing to inspire the next generation. John Phillips, London England: There is a shocking lack of top class provision for Watersports and Athletics in the UK. My daughter as an elite U7 waterpolo player has difficulty enough finding suitable training venues with out reducing yet further the provision in the capital of the UK. Jennifer Watson, London England: Without Crystal Palace athletics the local and surrounding communities will not have the opportunities to strive , grow and develop their talents. There is a strong legacy to be cherished. Dan Johnson, London England: I am local and use the track and adjoining sports injury clinic on a regular basis. This should be part of the olympic legacy for South London – I want my children to be able to do athletics locally. JENNY JACKSON, Beckenham England: Crystal Palace is where so many world records have been set ..the greats from all over the world loved competing at Crystal…the atmosphere was always amazing. We do NOT have a world class stadium and indoor track south of the river ..it is like athletes in the South do not exist..check your records…how many years in a row did Blackheath Harriers win the National Young athletes final ..yes its double figures, and yes many of their athletes trained at Crystal Palace. Joshua Street, London England: Because without Crystal Palace I would not have been able to represent Team GB and England at International level. Juliette Rohde, London England: The athletics stadium and indoor training track are a vital part of track and field events and training in south London.They play a vital role in school sports fixtures and are the main introduction for the majority of children in the area to the large part athletics can have have in their enjoyment of sport and as an example of how to have a healthier life style. Anais Daly-Gourdialsing, Bromley : I used to train in the sports centre as a diver and competed in diving and gymnastics competitions here. This area has shaped part of my life and has created unforgettable memories. It has changed lives and still continues to do so today. The managed decline of this stadium and indoor training track is appalling and definitely not what the so-called ‘London 2012 Legacy’ was supposed to bring. Something needs to be done. Lianne Sanderson, : I trained with Keith at The sports Centre from the age of 14. A massive part of my development into becoming a professional footballer. Great training environment and people. Eustace Northey, Londeon England: It’s the only place in london that can put on big meetings and is a good training area with all the facilities needed, with a indoor area for all. Lynne Harris, London England: Crystal Palace NSC has a wide range of facilities for a range of abilities from beginner to elite. If facilities are lost, it will make a mockery of the legacy we were promised from the 2012 London Olympics. The aquatics facilities in particular (50m pool and diving pool) make the Centre distinctive and offer essential training opportunites for young athletes as well as recreational swimmers. Sara Brayfield, : Crystal Palace Weightlifting has built, and continues to to build, numerous elite athletes in Britain that alot of people look up to and who are role models for an up coming weightlifting generation in England. Crystal Palace and was the first official British Weightlifting club I competed at and I hope to do so for many years to come. Patricia Trembath, Bromley England: Downgrade this to a Regional Sports Centre – OK. However there are many up and coming young sports people in the south-east who rely on this facility to train – the elite athletes, swimmers and divers of tomorrow. Steve Irvine, London England: There is still a case for a Regional Sports Centre (as envisaged in the original Masterplan) in the Park and that the Olympic facilities in East London are not seen by many athletes from the South of England, as being an accessible alternative. James Charles, Middleton Cheney England: This is the Heritage site for British Athletics, it has a history, and a provenance, that no other venue can provide! Nadeem Shaikh, Swansea : I raced at Crystal Palace many times back in the 90’s. I now coach athletics. Crystal Palace NSC is steeped in history, with so many world records broken in that stadium. They should invest and develop this iconic stadium, not trying to knock it down! William Davidson, LONDON England: South London needs more and better facilities not fewer. Anna Garnier, London England: Young people should be given the chance to run in this amazing place with the history it has behind it. It is so important that we support them because who knows, there may be many budding Olympians among them and they need to be given every chance. Great and honest leadership is needed to take Crystal Palace Stadium forward full circle to what it used to stand for. Let’s GO FOR IT. Tom Phillips, Maidstone England: It would be an act of sheer vandalism to shut this place. Maria fernanda Parodi, London England: My son plays football at crystal palace 4 times a week. I see the activity in swimming, diving, gymnastics, tennis, athletics etc every time I go. Always in full use. If anything, it should be supported more, revamped…. Harriet Abbiss, London England: As an ex-athlete, athletics fan and Crystal Palace resident I am surprised to have only just learnt of these plans via Facebook! The consultancy period is too short and not adequately publicised. Each time I pass the track, no matter day nor time, there are always people using it. The loss of this historic and well-used venue would be a travesty for South London and British Athletics. Steven McCready, London England: This place is so important for the people of South London and for potential elite level athletes. It should be protected from shortsighted repurposing. Canisus Alcindor, Northampton : I’ve got so many memories jumping against so many world class high jumpers at Crystal Palace for England and Great Britain And when I was competing for Birchfield Harriers , not forgetting all the training sessions we had with the national squad , I also remember getting a invitation to jump at Crystal Palace in midweek and that’s when Zola Budd run around the track barefooted for the first time in the UK . I’ve seen so many World Records made and broken at Crystal Palace .In the UK we have a shortage of indoor and outdoor training facilities so why on earth would they want to knock down an iconic building like Crystal Palace the has both and so much history for one and all .So it’s up to us past and present athletes to save Crystal Palace . 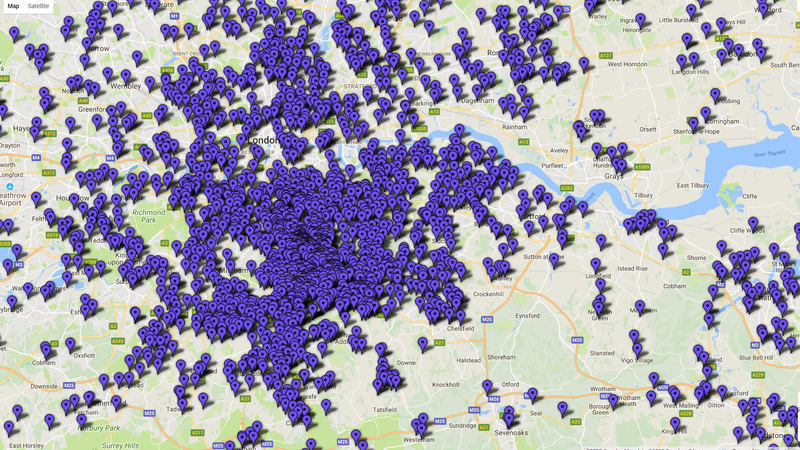 Andy Quinn, : There’s more to sport in London than Stratford. Corinne Cox, Tonypandy Wales; Cymru: Our niece Poi has spent many years achieving great things at this stadium !! Please keep this Stadium so important ..
Sheila Abbiss, Camberley England: This mustn’t happen! Memories of wonderful meetings hosted here. I’m appalled – it’s a fantastic venue. Sean Reidy, Peterborough England: I love this place, it is a truly great and historic stadium. It deserves to be maintained at least or better made a jewel of an athletics venue for London and the UK. Gabriella Faciotti John, London England: My daughter, aged 15, won a gold medal at the athletics finals at Crystal Palace in 2017 representing her sport club and I myself have been running and winning medals and cups years ago. Give young people the chance of practicing sport, sport if practiced in the right way is a school of life. Karyn Sackey, Peterborough England: There were amazing events here. The stadium built for the Olympics doesn’t have the same feel. And sporting facilities like this one help children continue in the sport. Joy Jobi, Luton England: I used to run and train here when I was an athlete for Croydon Harrier’s. I’m shocked. I used to come here and watch the greats compete….c’mon on guys this can’t happen! beth 9x, croydon England: A lot of history at this site and a need for it to be saved to create more history for future athletes. Frank Murphy, Cincinnati Ohio: The sport of track & field (Athletics) need this high profile venue to remain a part of the sport. Janice Le Brun, Jersey, C.I. : If it goes it will be detrimental to our future young athletes, please save it. Ishara Callan, Bromley England: We need more athletics grounds, not fewer. Helder Pina, Marylebone England: Millions are spent on war abroad when it can be spent at home promoting health and wellness through sport!!! Uk is Obesity number 1 country in Europe and 3rd in the world! Marcia Huls, : Iconic structures must be saved. marion rea, Horsham England: Power to the people! Nicola O’Neill, Warehorne England: These facilities are needed for the future of sport!! Richard Watts, London England: It’s very important to have access to sports and leisure facilities in a city the size of London. I have benefited from using sports facilities, including the NSC, throughout my life and I want future generations to have the same chance to do so as I did. Shirley Smith, London England: To help my brother to continue to succeed in his chosen sport. Rachel Howes, London England: CP is iconic. Invest in an upgrade, don’t simply reinforce the obesity crisis by getting rid of this facility which is absolutely vital to locals as well as a specialist venue for elite athletes and sportsmen and women. The Olympic Stadium has already gone; are we now seriously saying one of the world’s major cities will lack a stadium! ANTHONY FAVA, San Gwann : Youngsters need to be engaged more and a facility for sport like CP is a magnet that with the right management and marketing can regain its glory days. James Davison, Colchester England: Grass roots athletics is one of the first steps to a healthier community, nation, without these facilities the obesity epidemic would thrive even more so. Laura Ramsay, London England: Crystal Palace has history and a legacy that must be preserved for future generations ! Dwayne Dowding, London England: It is essential we keep athletics and weightlifting at Crystal Palace. The loss will have a major affect on the sports. Minda Owen, London : Im signing this because we need Athetics Facilities in London. Crystal Palace is the best place to use on winter season. Theres a lot of promising young talent on Atheletics and one of them is my Son. Nikki Andrews, Bromley England: There are no other facilities of the same around south London! My children have both enjoyed the facilities at Crystal Palace through school events too.It would be a travesty to lose the iconic Crystal Palace stadium. Serita Solomon, Orpington England: Crystal Palace is part of athletics history and needs to be revamped and put to good use for the next generation. Denise Hintzen-Herbert, Stoke-on-trent : This is part of Crystal Palace’s history and is the hub of the area. It is a well used and loved sports arena loved by MANY. Maureen Boyd, Bournemouth England: Crystal Palace is absolutely iconic. There can’t be anyone who loves athletics who doesn’t know of Crystal Palace and the wonderful athletes who trained/train there. At a time when fitness is a major issue for an increasingly obese population reducing sports facilities is ridiculous. Tom McKay, : Historic sporting site that provides opportunities for people not just in the south east but the whole city. Would be an irreplaceable loss to the community. Kirsty Carter, Bromley England: Because CP is important to us! Kelly Holmes, Hildenborough England: I agree. Crystal Palace has so much history. Change it by investing in it not destroying it. Regina Joyce, Seattle Washington: I grew up training and racing at Crystal Palace. Caroline Deans, London England: We need more decent, affordable sports facilities in London, not less. Lorraine Brown, Warrington England: It holds special memories for me personally. There aren’t enough training facilities for young people across London. Crystal Palace is an iconic Athletics Stadium both in Gt. Britain & Internationally & deserves to stay. Nickie Gore, London England: Leave it alone ! Development doesn’t necessarily improve and definitely limits . Annie Harvey, Carshalton England: it’s imperative to keep our sports and fitness facilities. Crystal Palace is a hub of excellence – why ruin it? What happened to the 2012 legacy? Graham Plunkett, Crawley England: Great idea to create an a flexible sports facility for the local schools and community to keep the legacy of 2012 going. Where are our future Olympians going to come from if we keep losing these facilities? Chris Isles, Beckenham England: Me and my family use this facility all the time. Jason Mulcahy, London England: This was my second home for 15 years of my life and the facilities enables me to train and be successful at my sport as it has done for so many others. The facilities offer great opportunities for people of all ages. Let’s keep it!! Sergio Cappelletto, Mestre : Because it’s is one of the best and iconic athletics venues in europe! Alan Mitchell, Edinburgh Scotland: Where else will people train locally? Michael Butler, Bognor Regis England: It’s worth keeping and is important for the community. Marian Spain, London England: Because it’s iconic and we need more not less of these places for future generations. Brigit Brown, London England: An essential community facility for South Londoners. All ages and abilities benefit. Too many opportunities to be sedentary these days, and not enough to be active. The knock-on cost of removing this venue will be higher than the cost of maintaining it. 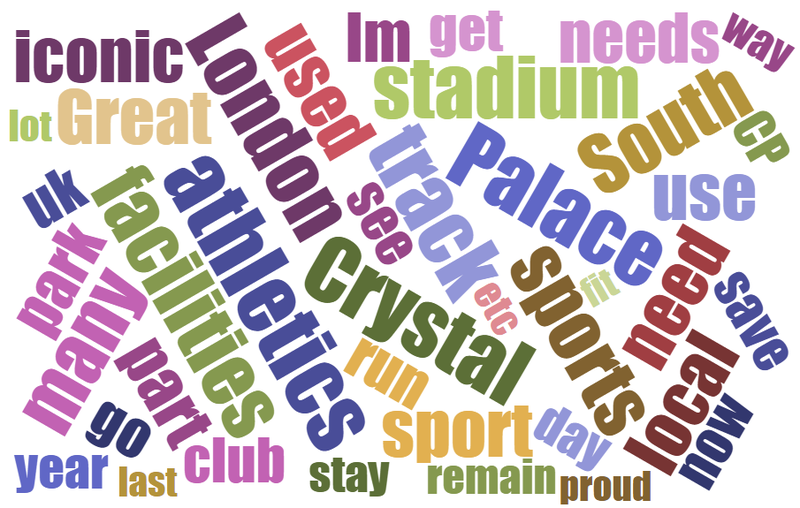 Donna Robinson, Dartford England: Crystal Palace is the heart of British Athletics…one of the first places you think of if you mention athletics in the UK. It needs to be refurbished and celebrated. Chris edgar, Poynton England: Athletics was very good too me and Jason Mulcahy, it gave us amazing times and we made many friends over the years. I believe there should be more facilities for the next generation not less. Geoffrey Kitchener, Fakenham England: I’ve used Crystal Palace indoor athletics facilities whenever I could find them available and have encouraged others to do so likewise. The interest from all ages in indoor competitions, when held, was heartening. We need to retain a facility like this within reach, without need to go to Lee Valley in far north London. Emma Kelly, London England: Let’s keep this piece of Olympic and sporting history. South East London and the sporting community need venues like this to train and enjoy the positive social and health benefits the venue brings. Sean Ryan, Coulsdon England: CPNSC has been at the centre of sport in South London for decades, I honestly don’t think I know a South Londoner that hasn’t used it, whether as a spectator, competitor or for leisure use. The athletics track can only be described as iconic, as a kid, I, along with friends and siblings would chase the stars of the day for autographs and were never disappointed. It deserves to be given the opportunity to thrive once again it is in an “upcoming” and thriving location with a buzzing social scene that a fully operational sports centre can only add to. It has unrivalled transport links – its own train station and multiple bus routes and the meeting point for five South London Boroughs, providing amazing views. It needs love and investment to thrive once more but I’m sure that is there. Rainer Kern, London England: With increasing residential properties, we need to increase or at minimum maintain existing sports and leisure facilities, not reduce them. This is such a short sighted idea. I bet someone stands to make a quick buck. Mary Orr, London England: It’s true- support the cause! Louisa Ellis, London England: It is important to have good facilities unavailable for our athletes without them having to travel miles. Trudy Kuhn, Carshalton England: There are so few athletics stadiums of this standard. So what if it needs a facelift, surely this could be done for a fraction of the cost needed to keep moving the seats at the Olympic stadium. Athletics tracks are few and far between, we need these facilities. Jennifer Campbell, BROMLEY England: Got to have something for the youngsters to do. If it has to close provide an alternative a solution. what happens to be inspired get active Close this what is next on the agenda. The local community needs the facilities and somewhere to go. Think again. Tonia Scott, Croydon England: I believe that the stadium should be saved. There are many up and coming track and field stars who use the facilities. We shouldn’t ignore the heritage of the site, just because stratford has been built. Invest money in restoring, not bulldozing. Gary Aldridge, London England: There needs to be facilities for the young & gifted athletes to train. Shirley Fantie, London England: I’m signing because this is an important resource for the community and for this country in terms of supporting future athletics. Jack Webb, London England: Crystal Palace sports centre is used by many schools for athletics lessons and sports days. It also has a great history and legacy in the UK. Where else in South London is their a stadium that caters for athletics ? We need to utilise the talent that many inner city children have. Andy Talbot, Newton Aycliffe England: I believe in keeping and maintaining all athletics tracks if Crystal Palace goes what happens next? Eadaoin boyle, Orpington England: I have looked going to track meetings here. It’s a brilliant track and can be utilised now for up and coming talent and the joy of the public. There is no point in crying about lack of activity in the population when you destroy all the facilities. Jessica Cargill Thompson, London England: This is an amazing resource of South London. Local children and teenagers (in particular, but not exclusively) need more access to such facilities, not less. If the stadium isn’t being used enough, then invite people to come and use it. There is no sports provision at primary level, which is shocking. Invite primary schools to come up for proper sports sessions. Give young athletes the chance to discover their talent. Give kids with nothing else to do in their lives a focus and an outlet for their energy. Stage some inter-school or inter-borough tournaments. Use the space for things other than athletics if necessary – arts, music, performance, bands, markets… It is so shortsighted and completely lacking in imagination to just demolish this amazing historic stadium. And whatever happened to the 2012 sports legacy? Annie Thomas, Hoddesdon England: I’m signing because I ran on this track the day it opened in 1964 and was brought up using so many of the facilities at Cystal Palace. the whole place was my inspiration for a lifetime involved in sport as a participant, PE teacher, volunteer, and supporter. I’ve seen many World Records in the stadium and the pool, played indoor and outdoor hockey there, participated in triathlons etc. etc. right up to the present day. Let’s all do our utmost to keep this facility alive and kicking for so many. Winsome Malcolm, London England: I live close by and frequently see large and small groups of young people on their way to the track. It’s a these times I think how wonderful we have facilities and opportunities for young people, and I feel proud of the ‘Palace’. There are precious few things in life that could actually change the course of a persons life, but it’s not rocket science to know this is one of them. Loved the road relay here! Would have been even better if the facilities were refurbished. Kristian Martin-Dominguez, London England: Crystal Palace Athletics Stadium and Facility is an inspiration and a legacy we must maintain for younger healthier generations. Rachel Chance, London England: We need a regional sports facility and to keep the park for public access and leisure. Reg Hook, Brighton England: It is essential that facilites in this area of London for both Training and top class competition. The facilities should be of a suitable to hold at least County and Area Athletic Competition. James Elton, London England: London is already short of top class sporting facilities and in light of the growing population there should be more and not less. Crystal Palace has a great tradition and is a resource we all rely on. Nicola Cornish, Lingfield England: I have fond memories of training on the track as a child & now my daughter is doing the same. There are regular open meetings during summer which are well attended as well as having hosted the SEAA champs in the summer. It would be such a shame to lose this fantastic facility as there are not many places left that allow future athletes to train in this environment. Please don’t get rid of athletics facilities at Crystal Palace as we need it for our youth especially. Raymond Fielding, London England: I’m signing this because i am an athlete at crystal palace and currently have no other place or choice to train with such excellent training. Ian Field, Purley England: This facility is absolutely key to the community and to elite sports people. Coached there for many years, mostly with kids who would otherwise have slipped through the healthy lifestyle net due to affordability of commercial sports facilities. It is almost literally, saving generations of kids lives.